We’ve reviewed a number of books having to do with the Donner Party. There have been many interpretations starting with lurid contemporary accounts immediately following the tragedy. The first serious treatment was by C.F. McGlashan in 1879, History of the Donner Party. He was the first to do actual historical research and interview participants rather than rely on sensationalistic reports. Following McGlashan authors have focused on the weather (McLaughlin, Donner Party Weathering the Storm), the rescue parties (Kaufman, Saving the Donner Party), the human element (Rarick, Desperate Passage), or just a basic history (Stewart, Ordeal by Hunger), etc. You can find those reviews and more in past Heirlooms or on our website . 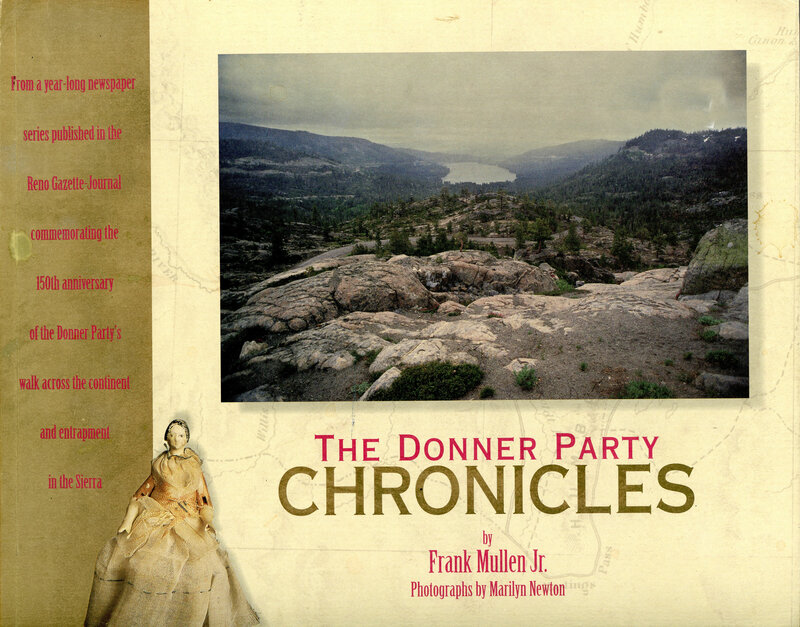 The Donner Party Chronicles is a different treatment. Frank Mulllen, Jr. approaches the topic from the perspective of a newspaperman. He reports the tragedy almost day by day with each page beginning with a newspaper type headline. In the Chronicles we can follow the events closely and so have a little different perspective from the typical history. For example there will be, in a typical history, a description of the Donner Party getting through the Hastings Cut-Off. Mullen lets us know what they are doing most of the days of that part of the trip with headlines leading us into the daily episodes. Originally the material was published in the Reno Gazette as a commemoration of the 150th anniversary of the Donner Party tragedy in 1996-97. 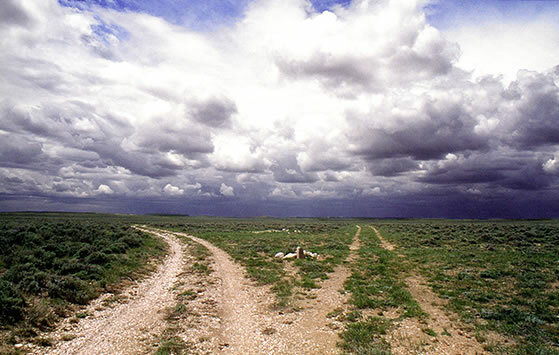 The book begins with a collection of contemporary photographs of the route and we can see exactly what the Donners saw. We can see the Hastings Cut-Off, above, and that ill-fated left-hand turn. Other pictures show the terrain the Donner Party crossed and brings to life many of the tragic episodes. For example there’s a picture of where James Reed stabbed John Snyder. That resulted in Reed’s banishment but also his early arrival in California which helped get rescue parties started. The book is made up of two page spreads for each reported day. The headlines indicate the date and what happened followed by the “newspaper” article. There are pictures in each spread, both historical and contemporary. There are pictures of artifacts and there is a map portion at the bottom of each page so the reader can follow the Donner Party’s progress to California. An eclectic mix of information comes with each article: historic ads, maps, quotes by historians or contemporaries, articles for perspective, e.g. Independence MO prices or what is happening elsewhere in the U.S., things carried by the Donner Party, documents, clothing, wagon components, the Pioneer Palace Car, and quotes from journals of Donner Party members and others. It’s almost like visiting a Donner Party museum. The headlines are evocative. For example, “May 24, 1846 Donner moving slowly westward; Bryant worries about progress.” On the facing page there is a quote by Bryant, “Singular as it may seem, there are many of our present party who have no just conceptions of the extent and labor of the journey before them. They appear to be desirous of shortening each day’s march as much as possible, and when once encamped are reluctant to move…” Indeed, Bryant eventually left the train, trade his wagon for mules and get to California weeks ahead of the Donner Party. Then he wrote What I Saw in California (1846), a review of which you can find in an old Heirloom or on our web site. Some of the headlines are prosaic, “May 26, 1846 Donners, Reeds reach Big Blue, do laundry, and hold meetings.” Others are of more import to the characters, “May 29, 1846 Grandmother Sarah dies in camp.” On July 19 there is the fateful turn, “The Donner Party is born; emigrants take left turn to ‘shortcut.’” That was of course “Hastings’ Long Tripp” as someone in a train before the Donners called the Cut-Off. That turn added about 125 miles and weeks to the journey. Good writing makes the story come alive, “November 3, 1846 Fresh snow thwarts attempt to cross Donner Pass” is the headline and in the text of the article, “Panic springs on them. Some of the pioneers are in such despair they refuse to make further effort to cross the mountain wall, a few miles away.” The Donner Party had chosen the Hastings Cut-Off optimistically thinking it would cut hundreds of miles from the trip. They’d go southwest directly, rather than go north like everyone else and then southwest. Hastings had promised to meet them and guide them through but he didn’t. They spent weeks on the cut-off. Then the desert was twice the distance they’d been told in a note Hastings had left. They’d lost cattle to Indians. They’d lost wagons. People had died on the journey. It was getting later and later in the season. They’d already suffered so much. Snow was coming, and then they saw the Sierra. They struggled up to Donner Lake in the snow. Some fought to get to the top of the pass where the snow was deeper. Imagine how they felt. The were worn out. They were cold and wet. It was freezing. Some slept on the snow under blankets and blankets of snow. No wonder panic and despair set in. Following the party day by day bring the reader closer to the experience. Then for good measure there are the quotes. Virginia Reed said, “When it was seen that the wagons could not go through the snow, the goods and provisions were packed on oxen and another start was made… men and women walking in the snow up to their waists, carrying their children in their arms and trying to drive their cattle… We camped within three miles of the summit. That nigh came the dreaded snow. We children slept soundly on our cold bed of snow… every few moments my mother would have to shake the shawl – our only coving – to keep us from being buried alive. In the morning the snow lay deep on the mountains and valley. With heavy hearts we turned back.” Their dreams of California, even though they were so close, were shattered. Despair is understandable. "In studying the Donner Party, I expected to find heroes, and villains, monsters and saints. Instead, I found families and a cascade of events which swept them to disaster They made mistakes; the biggest one was allowing the differences of class and race and national origin to keep them apart. Keseberg says they were bu born under a bad sign and what happened was predestined. It was not fate, but human failure that undid the Donners. The Donners are us, written very large." "Don’t take no cut-offs and get where you’re going as fast as you can.” ." "….it’s a compelling tale of people pushed to the limits of survival, overflowing with all the heroism and evil that attends such hard times. It is so awful in its particular, so dramatic in its inescapable chronology, and so compelling in its personae that it is, simply, a great story. But the details are so troublesome – it’s a witches brew of excellent contemporary sources, confusing reminiscences, lies and legends – and the material is so inherently dramatic, that perhaps it is a subject best left for novelists and dreamers. ….We learn that the Donner Party was not made up of heroes and villains, but of ordinary people, just like you and me, trapped in extraordinary circumstances." "The new road, or Hastings Cut-off, leaves the Fort Hall road here, and is said to be a saving of 350 or 400 miles in going to California, and a better route. There is however, or thought to be, one stretch of 40 miles without water… On the new route we will not have dust, as there are about 60 wagons ahead of us. The rest of the Californians went the long route feeling afraid of Hastings Cut-0ff. Mr. Bridger informs me that the route we design to take, is a fine level road, with plenty of water and grass, with the exception before stated. It is estimated that 700 miles will take us to Capt. Sutter’s Fort, which we hope to make in seven weeks from this day."